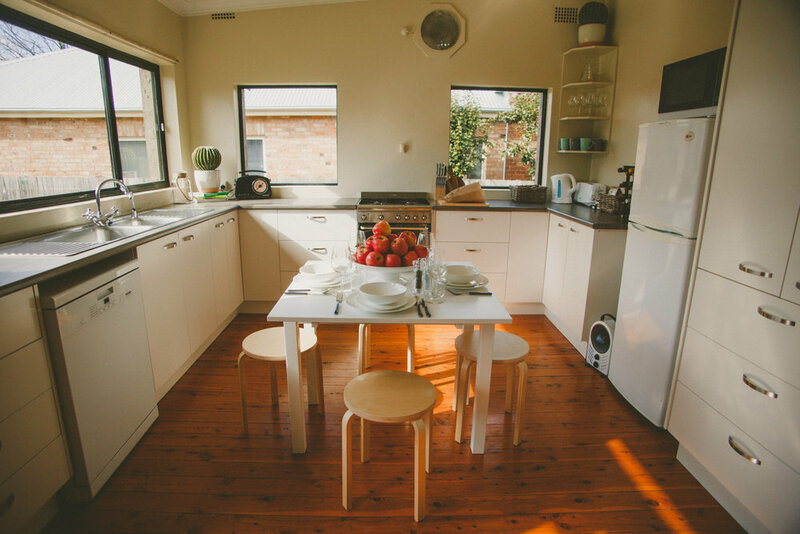 Cosy short-term accommodation in Orange, NSW. Built circa 1910, this cosy workers cottage is situated on Byng Street, just a short walk from Orange city centre. Perfect for professionals, large families or a romantic weekend getaway, Apple Cottage is tastefully furnished and has everything you need for a comfortable stay. All pillows, blankets, linen and towels are provided. There is one shared bathroom located off the kitchen and a working outside "dunny" for those that want some peace and quiet. The kitchen is well stocked with all the essential equipment for cooking up a storm if you get tired of eating out. There is a fridge, dishwasher, microwave and electric oven with gas cook top. The kitchen table seats six people comfortably and there is a bbq and outdoor seating area also. Off the kitchen is a laundry with washing machine, iron and ironing board. A hamper of local breakfast products is also included. The central living room has a log fire and plenty of comfortable seating. This is a really cosy place to relax and unwind, snuggle up on the couch with a glass of locally produced wine. There is a TV/DVD player, a selection of boardgames and ducted gas heating for when the weather turns really cold! We arrived to a fresh loaf of bread waiting for us, along with a lovely selection of jams, teas & coffees. The fireplace was set up ready to light, and the house itself was immaculate. We loved our stay; a beautifully furnished place, and the most amazing shower in the bathroom. We'll definitely be back again"
"Beautiful and cosy cottage in the most perfect location. Within walking distance to all the best restaurants, cafes and shopping in Orange. Byng Street cafe is just a few steps away. The decor of Apple Cottage is both tasteful and relaxing. The heating is so efficient we had to turn it off and the cottage still stayed warm. The beds are super comfortable and the bedlinen is beautiful. I wouldn't think of staying anywhere else in Orange. Can't wait to go back"